Touch screens are revolutionizing the way we interact with our gadgets, bringing features and ways to use a phone that was not even imagined 10 years ago. The facilities offered by the touch screen combine several factors and one of the major changes is, of course, the elimination of a physical keyboard - the equipment of which is lighter and leaner. And no matter what your device is - an iPhone, Galaxy S or a tablet - everyone will always have a common problem: finger marks all over the device. And what is the best way to clean a touch screen? What to use for cleaning? The main instrument to be used for cleaning a touchscreen is a washcloth. But you need to have a specific type of cloth for this use, since different cloths may damage the screen instead of cleaning. It is therefore extremely important that you use wipes specially developed for cleaning electronic gadgets such as touchscreen or even TVs and LCD or LED displays. These wipes are made from microfibers that do not harm the delicate construction of the screen of these devices. Moreover, the fibers of these towels are made so, that when rubbed on the surface do not cause risks, as can happen if you use a paper towel or the hem of your shirt, for example. This is so important that companies often recommend certain brands of wipes. However, if you do not see a specific brand indicated by the manufacturer of your gadget, know that there are better alternatives to clean up your device. 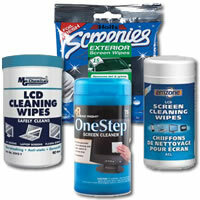 One excellent option is 3M Scotch Brite Hi-Tech Cleaning Cloth. This towel is for exclusive use in electronics and it works very well. Moreover, it has an affordable price and a worldwide known brand. Well, with the perfect towel in your hand, the first thing to do is turn off the device, and disconnect it from any power cable or the headphones. Besides, safety during cleaning will help you to identify dirty points on the gadget in time. With everything off, all you need to do is simple: just move the washcloth lightly on the screen, always making small circular movements. No need to use any type of product or even wet the towel, because the microfiber itself will take care of removing dirt and germs deposited on the screen. Some devices, such as the iPhone, come with a protective substance known as screen oleophobic coating. This "shield", we may say so, is able to repel the oil left by your fingers while using the device - and cleaning products can make this "jacket" quickly lose effectiveness. Moreover, many of these cleaners have corrosive substances capable of affecting the operation of your gadget. So, do not use glass cleaner, soap powder or any product containing alcohol, ammonia or ingredients of this type. Also remember that the guarantee certificates of almost all companies do not cover damage caused by liquids. You were eating bread filled with guava and dropped a generous serving of jelly on the screen of your device? Well in that case, perhaps only use the washcloth that is not dry enough. When you get rid of the dirt from fingerprints and sweat, get a small bowl and fill with water. Then pour a drop or two of dishwashing detergent and mix in jar. With this solution set, take a small part of the washcloth and dip into the water. Then make a circular motion gently on the handset screen, as was said earlier in time to do a normal cleaning. Then use the dry part of the washcloth to finish. If necessary, repeat the process, but always remember not to scrub the dirt hard or wet the appliance too much so that not to cause scratches or other severe traumas to your gadget. Also, do not pour water or spray any liquid directly on the screen. If you do not find a washcloth specifically for this type of cleaning in any store and also do not want to wait until the purchased over the Internet one reaches your home, there are some workarounds. You can, for example, use some other very soft cloth, extremely clean - preferably the one that has never been used. But remember that using appropriate products is the best way to clean the screen of your gadgets. If you are live in Turkey and ofttimes call overseas you need take note to AT&T calling cards. For cheapest prices for long distance calls from New Zealand please take a look at Continental phone cards. For calls from China to other countries the best to use Partner telephone card. Regardless how many times I clean my phone with the special products or without them, within next hours it again starts being dirty. I love my touch screen, but this dirty screen… I believe there is still a room for improvement for the manufacturers. Hopefully, one day this problem will be solved.